One of the biggest announcements in the Apple Watch Series 4 reveal was the ability for the smartwatch to take an electrocardiogram, commonly referred to as an ECG or an EKG. While it wasn't available at release, the Apple Watch ECG app was introduced in the watchOS 5.1.2 update. In order to check your heart rate and heart rhythm, you may need to update your Apple Watch to the latest version of watchOS. You'll also need to perform a quick setup in the Apple Health app, but then you'll be ready to take an ECG reading using just your Apple Watch. Confused about the difference between an ECG and an EKG? They are actually the same thing. Both abbreviations refer to an electrocardiogram. It is actually quite easy to take an ECG reading using your Apple Watch, but before you get started, you will need to setup the ECG feature using the Health app on your iPhone. The Health app is also where you can view reports on your heart rate including your walking heart rate, resting hear rate and additional data from the iPhone and Apple Watch activity apps. If you have updated the Apple Watch's watchOS to 5.1.2 or later, the Health app will prompt you to enter your date of birth. After you have set up the ECG app on your iPhone, you can take your first reading by launching the ECG app on your Apple Watch. This is the app icon with the white background and the red heartbeat. When you launch the app, a heart will appear and you will be directed to hold your finger on the digital crown of the watch. Do not click the crown. You simply need to rest your finger against the crown. It is also important to keep your arm motionless and to rest your arm on a table or your lap. This is to avoid the need to hold your arm up, which can affect results. The ECG app will record your heart rate for 30 seconds before giving you the results. What Do the Apple Watch ECG Results Mean? The ECG reading taken by the Apple Watch shouldn't be confused with an ECG done by a doctor. The ECG app is not as thorough (or accurate) as one performed by a doctor and will not be able to detect a heart attack. However, the Apple Watch ECG can detect certain issues with your heart rate including an irregular rhythm. Let's take a look at the results of an ECG and what they mean. Sinus Rhythm: This is the good news. Your heart is beating in a normal, uniform pattern with no problems detected. 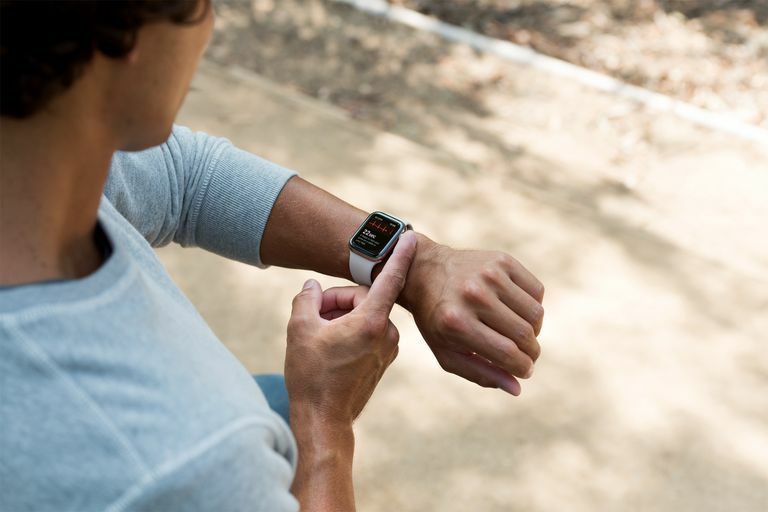 Low Heart Rate: Apple Watch registers a low heart rate at 50 beats-per-minute (BPM) or less. The medical term for a low heart rate is bradycardia and can be due to medical issues or medications. Elite athletes can also register a low heart rate. A low heart rate reading can also be due to issues measuring the heart rate such as a loose watch band. A low heart rate reading will interfere with the Apple Watch's ability to detect atrial fibrillation. High Heart Rate. A heart rate over 120 BPM is considered high. This condition is called tachycardia and can be due to recent exercise, stress, alcohol, certain over-the-counter medications, or medical conditions such as heart disease or thyroid disease. Atrial Fibrillation (AFib): The heart is beating in an irregular pattern, which occurs when the upper and lower chambers of the heart are beating out of sync. It is important to again note that the Apple Watch's ECG isn't as accurate as that taken by a doctor and cannot specifically diagnose AFib. The cause of the irregular pattern can be from conditions like high blood pressure or sleep apnea. It can also be caused by alcohol, tobacco or even caffeine. Inconclusive. If the Apple Watch is unable to measure the heart rate, it will return inconclusive results. This can be due to a too-loose band or too much movement while taking the ECG. The ability to take your own ECG is cool, but the best feature of Apple Watch's ECG app is the ability to periodically check for an irregular heart rhythm and notify you if Apple Watch detects a rhythm that may be atrial fibrillation. This means you don't need to sit down and check your ECG reading to get a warning about an irregular heart rhythm. First, launch the Health app on your iPhone. Scroll down and choose Irregular Rhythm Notifications. Select Set Up Notifications and tap Continue. Chose whether or not you have ever been diagnosed with AFib. You will be walked through a series of information tidbits about AFib as it applies to Apple Watch. You will need to tap Continue at each step. Last, tap Turn on Notifications. Tap the My Watch tab at the bottom of the screen. Choose Heart from the list. Tap the on/off switch next to Irregular Rhythm. You can also turn on or off notifications for high heart rate or low heart rate. You will be asked for a heart rate threshold. The high heart rate notification will only occur when Apple Watch believes you have been inactive for at least 10 minutes. The low heart rate notification occurs when your heart rat dips below a selected heart rate for at least 10 minutes.